Don’t understand why this measure is being taken. Reason only comes to public when nothing left to be done indication given in advance and that is very high pledging by promoters, which is not being discussed as it should have done. Prakash Industries AR 2018 highlights. During the year under review, the Company’s Net Sales revenue grew by 35% to 2935 crores as against 2174 crores in the previous year. The EBITDA for the year was 596 crores in comparison to 265 crores in the previous year reflecting a growth of 125%. profit after tax of the Company grew by more than 390% to 384 crores as against 78 crores in the previous year, which resulted in EPS of 25.58 in the current year as against 5.97 in the previous year. The operating margins have jumped to 20% against 12% in the previous year. During the year, the Company expanded its Sponge Iron capacity by setting up an additional Rotary kiln of 0.20 Mn tonnes per annum, thereby enhancing the total capacity to 1.00 Mn tonnes per annum. Alongwith the kiln, the Company also added 15 MW power co-generation capacity during the year. In the Steel Melting Shop, the Company set up new furnaces and also modernized some of the existing furnaces with energy efficient furnaces during the year. As a step towards efficient raw material management, the Company has been able to secure Long term supply arrangements with its suppliers for the key inputs i.e. coal and iron ore at stable prices. The performance of the Rigid PVC Pipe division was also satisfactory during the year under review. The division achieved highest ever production during the year. In view of the huge unrealized growth potential in the PVC Pipe industry, the Company is doubling its production capacity by next year. Company has strategically ventured into Flexible Plastic Packaging business at it’s existing plant at Kashipur, which will manufacture high performance barrier films and laminates that find application in packaging of food, beverages, oil, personal care and pharmaceutical products. The production is expected to commence by June, 2018. The steel industry in the country is witnessing a major uptrend with ever growing gaps in demand and supply. 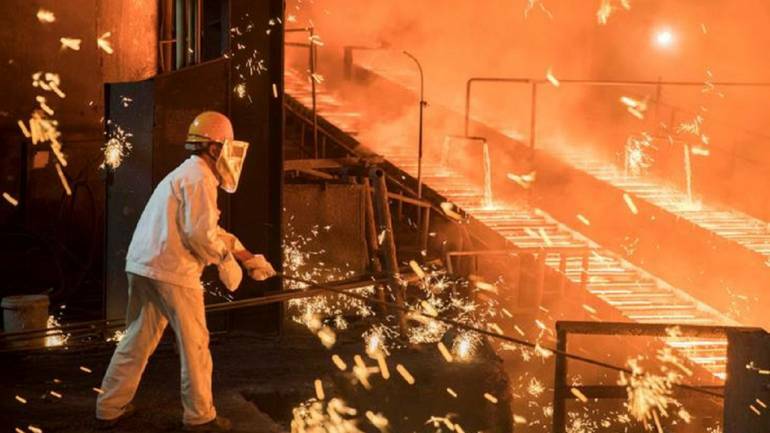 To exploit and take advantage of the situation, the Company has taken up expansion plan to increase its steel capacity from 1 Mn tonnes per annum to 3 Mn tonnes per annum in a phased manner over the next 5 years at its Integrated Steel Plant in Chhattisgarh. In this direction, the Company is enhancing its capacity in Sponge Iron by 0.40 Mn tonnes per annum alongwith related expansion in the steel melting shop this year. Further, in order to achieve next level of integration in its operations, the Company is making all its efforts to open its Sirkaguttu Iron Ore Mine in the state of Odisha in the first quarter of the current financial year. Also, the Kawardha iron ore mine allotted to the Company in the state of Chhattisgarh is expected to be operational by next year by April 2019. In addition, the Company is also setting up a Private Railway Siding at its plant. These events shall boost the performance quotient of the Company to a significant extent in the coming years. The sales volume in the steel division recorded growth of approx. 13% in the year under review over the last financial year. In one case where 310000 equity shares of promoter group sold by pledgee on 14.08.2017. Qualified opinion by auditor. We refer note no 37 and 39 of the Standalone Financial Statement that the deferred tax liability of 2,741 lakhs for the year ended on March 31, 2018 has been adjusted against Securities Premium Account by the Company in terms of a court order. Further, the MAT Credit Entitlement not availed within the time allowed aggregating to 4,931 lakhs for the year ended March 31, 2018 has been adjusted against retained earnings. Had these been accounted for pursuant to Ind AS -12 ‘Income Taxes’, net profit and total comprehensive income after tax for the year ended on March 31, 2018 would have been lower ` 7,672 lakhs. Company shows it’s major profits from Power Segment as profits from generation of power is exempt u/s 80-IA of income tax act. 100% profits is deductible for a period of 10 years for the plants commissioned before 31st March 2017. As per 2012 Annual Report of the company, it commenced 100 MW power plant capacity in 2012 (plan was to add 625 MW by 2015). Thereafter they have kept on adding capacity every year (for e.g. 15 MW in 2018). We need better understanding of the following points. Does this mean that the company will enjoy tax benefits till 2021? How much electricity is produced by the company (capacity utilisation)? At what rate do they sell it to steel segment? Are they overcharging the steel segment to show inflated profits in power segment? Did anyone know the status of CBI case against Prakash Industries ? I googled, but couldn’t find the answer. Thanks for the summary. I have a few questions. If anyone can throw light, it will be very useful. When steel is doing great, what is the need to get into flexible packaging? Is there a connection at all? Am I missing some synergy here? Company is saying, it will triple its steel capacity from 1 m to 3m in next few years. Is it a doable target or too aggressive? What could the demand situation down the years? Is there any talk or plan on dividends? Disc: hold in my portfolio. Can money be siphoned in the name of capital work in progress? The AR has no detail on the capital expenditure. The current Power capacity is around 230 MW. Yes, the company is enjoying tax benefits, however the same is subjected to MAT. I presume that the capacity utilization is around 70% and 100% of it is for captive consumption. The power transfer to Steel Division is at market determined rate and there guidelines have been defined for fixing this rate. (It is not at arbitrary rate.) They cannot overcharge on their will. Yes, If the management is not trust worth then money can be siphoned off in a number of ways including CPIW. The discount at which this company is available is only because the Mr. Market does not have a trust on the promoters. The flexible packaging is part of their plastic business. Plastic business is altogether a different vertical. The company is in plastic bushiness for the last more then 15 years . It is very aggressive target and alos very capital intensive. The demand of steel however seems to be robust in coming 2 to 3 years. The company has never been a very good dividend payer and looking to the CAPEX plans the dividend payout if any will also be very less. Thanks a lot. Sure, it clarfies. If you consider next 5-10 years, demand is certainly not a problem. Fact of the matter is that for the Indian economy to accelerate , which is the most likely scenario, steel supply is a constraint. If India and China both do well simultaneously then steel demand will certainly outweigh supply. Look at the recent example of Railways alleging SAIL for not being able to supply the rails at required pace. With this captive sourcing of Iron Ore, the company's dependence on open market sources will reduce substantially. My view is whether the stock is in ASM or out of ASM it hardly matters for investors, it affects only traders. I think, if true, it is positive for price movement. ASM induces negative sentiment and depresses the prices. Let us try to get confirmation of this development. One can surely expect a very positive Q1. We also need to know if Jhunjhunwala has increased /decreases his holding in Q1.